Axis Of Oversteer: What warms up your tires? What warms up your tires? 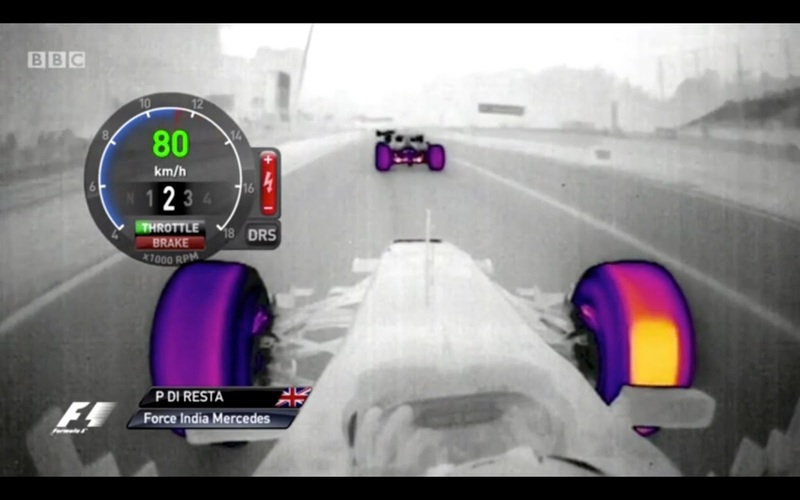 If you've ever wondered how much of a factor heat from the brakes is in heating tires on an F1 car, look no further than this video of Paul Di Resta's warm up lap through that cool infrared camera. Several interesting bits: At the very first chicane he locks up just a bit and you can see what a dramatic hotspot that creates. You can see how much the airflow cools the rubber but also how quickly it lights up in the corners, Interesting that you see the inside wheel light up under braking. Finally as the car comes to a stanstill on the grid, you see the effect of brake heat. Check out how at the green , you can see the cold spot from where the tire was touching the asphalt! All that heat though was not enough to prevent Di Rest from locking up into the Variante della Roggia (T4...) and smashing into Grosjean's Lotus, which miraculously survived the impact. Track surface acts as heat sink, thereby reducing tire temperature locally. Not only does the lock up make the tires glow red hot, it also leaves a red hot streak on the track. Also, while he's on the grid you can watch the heat soak in the car in front of him.